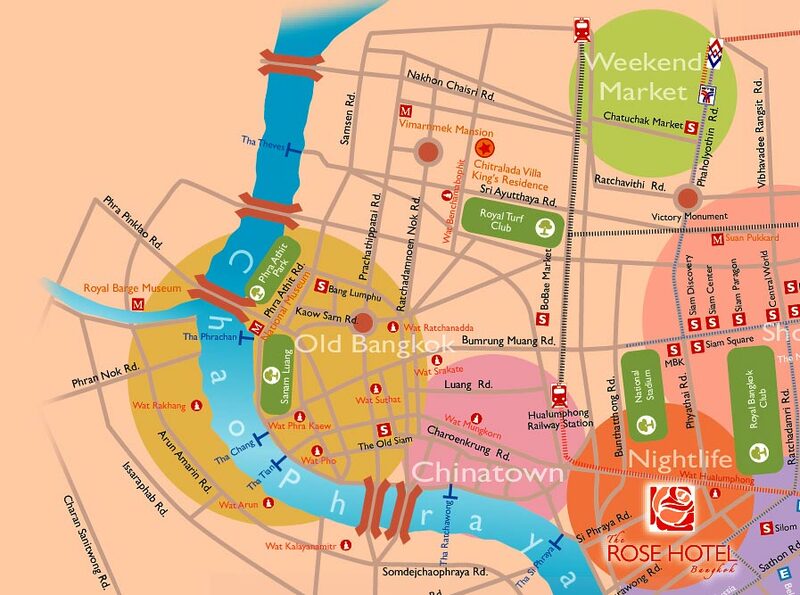 The Rose Hotel Bangkok is ideally located in the heart of the city. This prime position is the center of business, shopping, and entertainment area. or by MRT subway system. Getting around Bangkok is very easy from the Hotel. Surawongse and Silom Roads, Bangkok’s 'Wall Street,' is by day the center of financial institutions, law firms, and multinational corporations. By night, however, the street slips out of its suit, and transforms into a bustling shopping street and frenetically paced hedonist's playground. Patpong, one of the world's most (in)famous red-light districts, is where the pulsating heart is. Patpong 1 and 2 , as well as Thaniya Road, parallel between Silom and Surawongse Roads and house around 100 neon-lit bars offering shows and entertainment. The night market teems with hawkers and humble stalls selling mostly tourist trinkets and souvenirs. 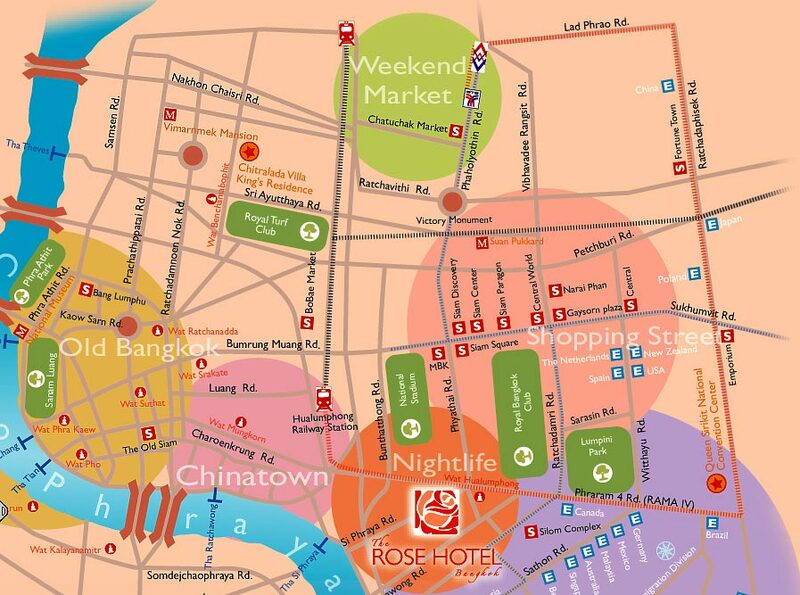 Around the cramped corner, sit the city’s most renowned and raucous streets, Silom Soi 2 and Soi 4. Soi Na Wat Hualumpong. 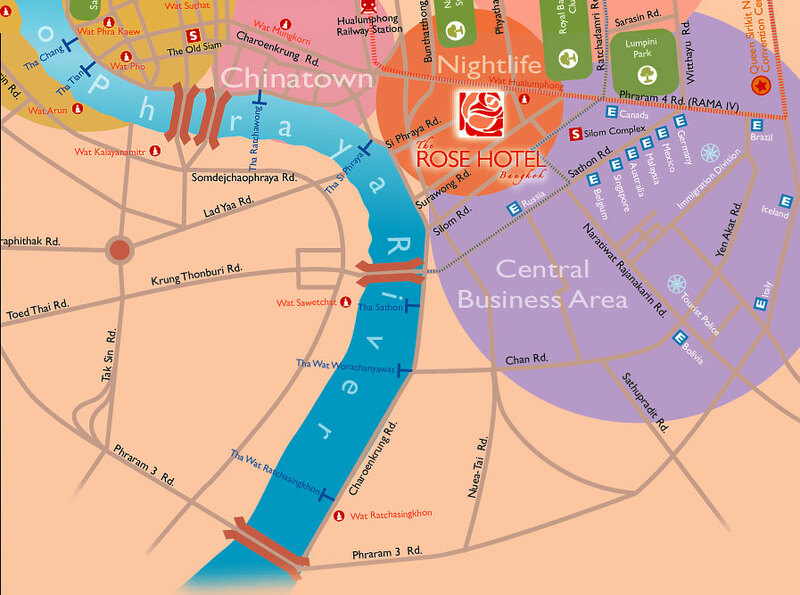 The Rose Hotel is less than 100 meters from the entrance. Please stop at Saladaeng Station and use the exit on Thaniya Road. Just walk through the end of the street and turn left on Surawongse Road. The lane to the hotel is on the right after Patpong 1 Road. Please stop at Sam Yan Station and exit from the Wat Hualumpong side of Rama IV Road. Then walk through Soi Na Wat Hualumpong toward Surawongse Road.